Amore is our mischief-maker. She is 85% imp, 15 % jokester and comedian. 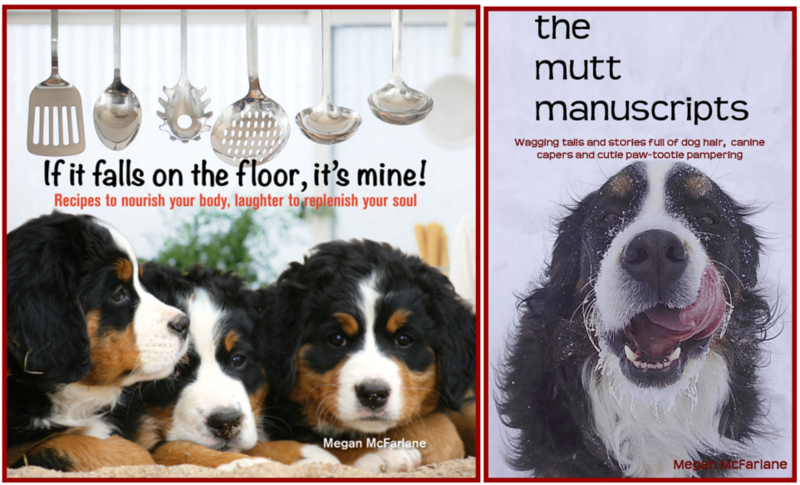 Full-blooded Bernese Mountain Dog, full-thottle prankster, and full-of-it canine with a sneaky smile to match. From day one, Amore has been our trouble-maker. She was the first to crawl out of the whelping pen, creating a mass ascension with her seven siblings, following in her paw steps. She was the first to bark, yelp and whine, producing a chorus of noise, usually at night, usually late at night and usually with all her litter mates! She was and still is the first to gobble up her chow, then proceeding over to Dolce’s bowl to impose a feeding tax on any leftovers. She was Tiamo’s first pick, the only puppy in the litter Mama loved to play with. Amore was the first to discover the dog door, quickly learning if she went through the swinging flap, there was a bite of raw hamburger on the other side. While a great training tool, the first night, she went back and forth through the doggie door for an hour straight looking for her treat. At 2:00 a.m. we stumbled with barely opened eyes to the frig and found more ground burger to give her. For the next week, that dog door was her best friend. Amore loves to tease Malcolm. When it’s time to load up in the car for a ride, she runs straight to the tailgate, fakes to the left before the jump in, swinging around the vehicle and on to the back field at a full run. She’ll wait for Malcolm to come around the corner of the house before sprinting around the other side. The cat and mouse game continues until Malcolm tires of walking around the house and Amore realizes she might be left at home. I’ll never forget the first and only time I let Amore walk with me up to the road to retrieve the morning paper without a leash. 5:30 in the morning, pitch black skies with the sun still hiding in the far east, Amore takes off after a cotton-tail. She recognized her freedom – the chase was on. I tried everything to get her to return to me. She would get within 10 yards and stay just beyond my reach. I knew I needed to out trick the trickster. Somewhere I had read to lay down on the ground and play opossum. In my skirt and high heels, I laid down on the gravel driveway with the Santa Fe New Mexican as my pillow. I waited. Amore waited. One minute seemed like twenty, I heard the crunch of her paws on the gravel, I waited, eyes closed. I felt a cold nose on my cheek and then several wet sloppy dog licks all over my face, Amore checking to see if I was ok. I grabbed her collar, refusing to let go of our 100 pound bunny chaser. I gazed up at her and I swear I saw her wink at me. She knew all along my intentions. My golden moment of euphoria, having “won” the game, having outsmarted and outmaneuvered a canine comedian crumbled like broken chips at the bottom of the Frito bag. That wink says it all. With a twinkle in her eye, Amore is our prank-pulling pooch. Her goofy grin, her playful antics, her doggy humor, her canine pranks, Amore has perfect timing with her delivery. She knows the exact moment when to nose-nudge your elbow as you raise your glass of wine to take a sip. She knows the exact moment when you go to sit on the couch and she beats you to your spot, then rolling over onto her back so you can’t pull her off the cushions. She knows the exact moment when to rub up against you as you are leaving to go to an important meeting in your wool suit and you don’t have time to change out of your now dog-haired attire. She knows the exact moment you are done fluffing the blankets and pulling up the bed covers as you prep for sleep, so she can jump up on the bed and curl up on your favorite down feathered pillows. She knows the exact moment when to send you a wink and a smile, a grin and a chortle, reminding you not to take life so seriously. She knows her doggy grin will get her out of trouble and her adorable canine chortle will let her stay on the bed. Our winkster, Amore!